Obituary – Lambert, Lloyd Willard « Perry High School Alumni Association, Inc.
Lloyd W. Lambert, 87, former long-time Sumner community resident, died at 5 p.m. Tuesday at his home at 901 North Brookwood. Funeral will be at 10 a.m. Friday at the chapel of Brown Funeral home. Rev. David Dickinson, pastor of the First Christian church of Perry, will officiate. Burial will be at Sumner cemetery. Memorials may be made to the First Christian church of Perry or to the charity of the donor’s choice. Lambert, the son of Edker and Edna Lambert, was born east of Perry, Dec. 6, 1901. 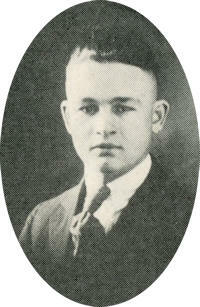 He attended Willow Creek school and graduated from Perry high school in 1920. He attend­ed Sweeney Automotive School in Kansas City, Mo. He purchased the Sumner Garage which he operated along with a retail fuel business until his retirement in 1971. He and Lora Benson were married on May 14, 1930. The couple lived at Sumner until his retirement when they moved to Perry. Lambert was a member of the First Christian church of Perry. In addition to Mrs. Lambert, of the home; sur­vivors include four daughters, Mrs. Frank (Carolyn) Burns, Wichita Falls, Texas; Jean Yeager, Wichita, Kan.; Mrs. Jack (Anne) Bernard, Grand Island, Neb. ; and Mrs. Eldon ( Janis) Dennis, Juneau, Alaska; one son, Richard Lambert, Perry; and seven grandchildren.